Just a couple of months ago I reviewed Douglas Fairbanks’ 1924 version of The Thief of Bagdad, which blew me away. It was the most spectacular silent movie I’d ever seen which was as fun as it was awe inspiring. Having heard good things about Alexander Korda’s 1940 version, I was keen to compare the two films, so jumped at the chance of reviewing Network’s new Blu-Ray release of the film. Because of this, my review will largely be matching the later film against the earlier one, so forgive me if you’re more interested in how it stands alone, but I saw the first so recently it’s difficult not to compare and contrast. In terms of plot, although a number of core aspects and some key scenes are the same (coming from stories from the Arabian Nights), much of what and how it happens is quite different. The big change is in basically splitting the thief character from the 1924 film into two. 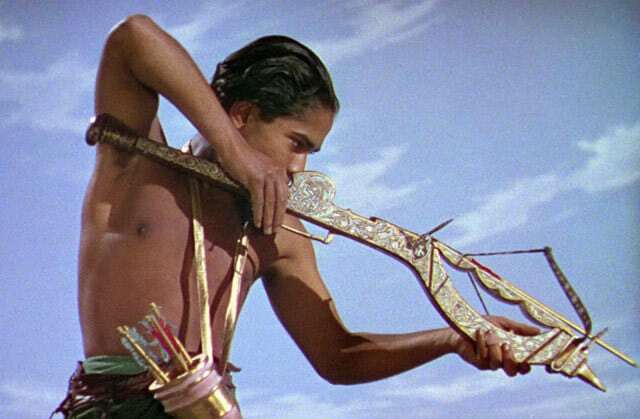 The titular thief in Korda’s version is young Abu (Sabu), who pinches food to survive as well as to cause mischief, but the love story driving things forward is instead given to Ahmad (John Justin). 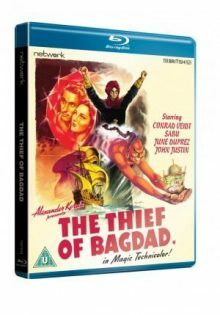 Ahmad is the rightful king of Bagdad, but the evil Jaffar (Conrad Veidt) tricks him into being captured as a thief and throws him in jail. Here he meets Abu who also got arrested and sentenced to death. The two escape together and set off for a life of adventure. However, not long into this new life, Ahmad sets eyes on the Princess of Basra and instantly falls in love. This begins a quest to win her hand (he wins her heart straight away), which is made very difficult as Jaffar is also besotted with the princess and has the magical power and resources to keep Ahmad at bay. Thus begins an adventure which involves a mechanical flying horse, a giant genie and Abu being turned into a dog. I’ll get it out of the way and say that I preferred the 1924 version (if you haven’t already spotted by my score). However, that isn’t to say I didn’t like this later incarnation of the classic Arabian Nights stories or that there haven’t been improvements made in it. The main aspect which works better here is the storytelling. The script and pace is much tighter here (made clear by the 45 minute time difference). As much as I was impressed by Fairbanks’ epic fantasy film, it was a tad too long and took a while to hit its highest gears. This is fairly efficient and keeps the adventure driving things forward. An improved script would generally equal a better film, but the silent version of The Thief of Bagdad won me over through its breathtaking scale, beautiful production design and the endless charm of its protagonist. With the art director from the 1924 version, William Cameron Menzies, down as an executive producer on the colour remake, as well as one of the many (uncredited) directors, I expected great things from the visuals. For the most part that is what I got. It’s wonderfully colourful and flamboyant, giving a true technicolour feast for the eyes. However, it didn’t quite match the extravagant splendour of the earlier film. Strangely enough, being 16 years newer, it looks more dated than its predecessor. The designs don’t look quite as timeless and where Fairbanks pulled out all the stops and built mind-bogglingly enormous sets and achieved most of his effects practically, Korda’s film uses more matte paintings and other fakery, including the world’s first chroma keying. The latter is to be commended, revolutionising the way special effects were made forever. However, it obviously doesn’t look as good as chroma keying generally looks now, so instantly dates the film. Another aspect where Korda’s vision falls a little short is in the overall tone. It does have that old fashioned charm I hoped it would, but occasionally gets a bit slushy and melodramatic. 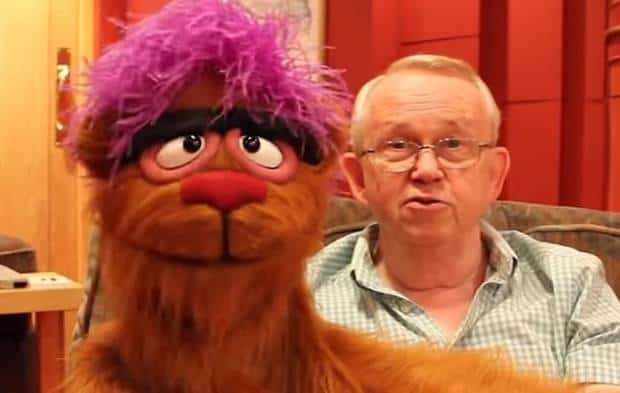 The two heroes aren’t a match for Fairbanks in terms of charisma either. Sabu is full of youthful enthusiasm, but he’s not the experienced showman of his predecessor and he shares the limelight with Justin who is rather bland in comparison. Rex Ingram as the genie livens things up a lot though with a showstopping and spirited performance. Unfortunately he’s only in a relatively small proportion of the film and in his flying sequences is clearly replaced by a plastic model. I don’t want to bash the film too much though. It’s an enjoyable old-fashioned adventure which is a pleasure to watch as well as a visual treat. However, I couldn’t knock the feeling that it stood in the shadow of the 1924 version and never quite stepped out of it. The Thief of Bagdad is out in on Blu-Ray on 26th January, released by Network as part of their The British Film collection. The HD picture looks good. There are a couple of soft shots, including some where the colour layers seem misaligned, but I imagine these are in the source material and can’t be fixed. There’s a very slight flicker occasionally too and the grain is a little strong. In general this looks great for a film of its age though and the colours are represented very nicely – strong without looking over-saturated. Unfortunately there aren’t many features included, only a trailer and image galleries.